If you fancy a take on the classic Pissaladière without the pastry, to be served as a snack or an informal entrée, look no further than this little number. The appeal of this recipe is in its burst of flavour as soon as all the ingredients combine in the heat of the oven. 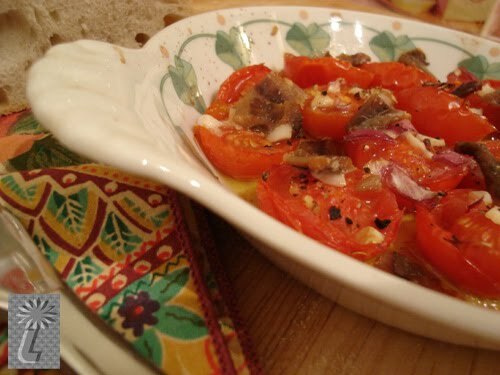 They produce a melting tomato and anchovy concoction that may be eaten straight out of the ramekin, or spread - still warm - onto fresh baguette slices, like pâté! Anchovies may be substituted with prosciutto or Parma ham (see 2nd picture), if preferred. Cherry tomatoes (which are slightly smaller in size than the midi plums) may be used for this recipe, as they are more readily available in shops! Preheat the oven (190°C). Grease two oven-proof ramekins. Halve the tomatoes and arrange them in the dishes, cut side facing up. Add the crushed garlic and diced onion, then liberally sprinkle with olive oil. Arrange the chopped up anchovy fillets on top, and season (bearing in mind that the anchovies will be quite salty already!). If you wish so, sprinkle a little thyme and decorate each ramekin with a couple of black olives, for that authentic Provençal touch! 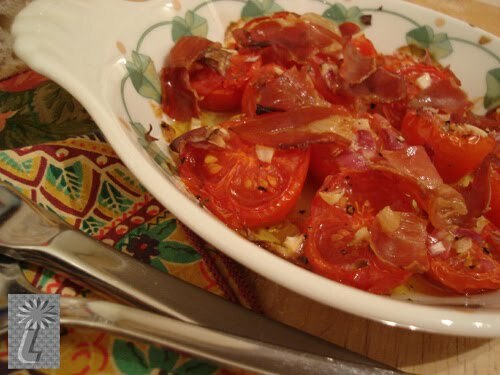 Pop in the oven for 25 mins (or 20 mins if using cherry tomatoes), and prepare to melt!